Yesterday morning, my husband called and asked if we had time to meet for lunch. This is a rare event, it is not often that he is able to escape work during the day, so of course I packed a quick meal for Charlotte and the kids and I jumped in the van to meet him at one of his favorite restaurants, Rubio’s. 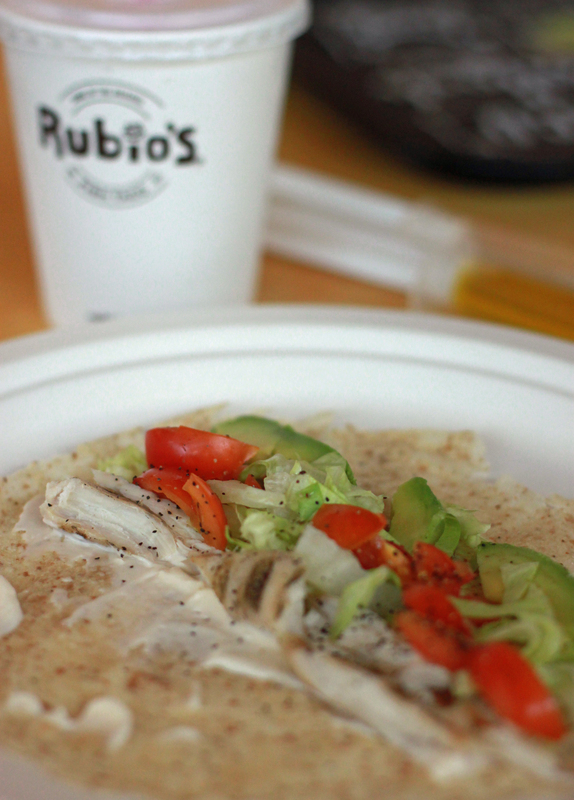 Rubio’s serves tacos (mostly fish) and burritos, that’s about it. I already had cooked chicken set aside in the freezer for Charlotte and I recently tried the low carb tortillas as bread crumbs on the avocado fries, so I had them on hand as well. I thought this was a great opportunity to use the tortilla as it was intended to be used, and boy was she one happy girl! I can not take credit for the tortilla trick that I’m sharing, I also can not remember who first shared the idea on the keto yahoo group, so if it was you, let me know… I would love to give credit where credit is due! Charlotte is at a 3.5:1 ratio, so this still does not allow for many carbs in her meals. You would think a full size round tortilla would be out of the question, BUT if you heat the tortilla in the microwave for a few seconds until it is warm a flexible, you will notice that it has layers that you can pull apart. You have to be careful, but you can slide a knife in the tortilla and then carefully pull it apart into two thin layers. One side will be thicker than the other, I used the very “tissue” thin side. It weighed just over 11g, so that is how much I calculated for the recipe. Amazingly, even though the tortilla was used in this meal, the meal ended up over her recommended protein and below the recommended carbohydrate allowance! The rest of the meal was easy, just basic taco ingredients. I did use only oil for the fat, knowing that it would not take away from the carbohydrate allowance for the meal. You can see the 2 syringes in the background. I always recommend trying to teach your keto kid to take oil like a medication in a syringe, once they get it down it makes simple meals easy to prepare and traveling with oil very convenient. Lastly and most importantly, the low carb tortillas are, *a very special treat* for Charlotte. I use them no more than once per month since this is a new item for her. I am always very cautious when using low carb products for reasons like this, please read this carefully (CLICK HERE)! In fact the tortillas are the only low carb product we have used since starting the diet 2 years ago. ALWAYS ask your dietitian before incorporating items like these into the keto diet! Heat and separate the tortillas into layers as described above. They will be fragile, but it did hold together. If you are not serving them immediately, lay it flat on plastic wrap and roll up so it does not dry out. Spread the mayonnaise on the tortilla and top with the chicken, avocado, tomato and lettuce (if using). Season with salt and pepper. Roll the taco up and eat! Cut it into smaller pieces for younger children. Serve the oil or other chosen fats on the side. Hi Dawn, My son Carey recently became a Keto Kid. He is 10 years old with LGS. I found your suringe tip very interesting. Reason being is that Carey has a sensitive palate and the fat is something we are struggling with. I’m curious if this will work for him. He began the diet 3 weeks ago so we’re newbies and the whole thing is overwhelming to say the least. To compound things, he went back to school last week and we’re having a difficult time with the eating issue as a whole. He knows what regular food tastes like and has never had a restricted diet so to go from that to Ketogenitc is heartbreaking for him. I would love more tips on ways to “hide” the fat as much as possible. He started on 4:1 ratio however as of today he was moved to 3:1 due to not being able to tollerate and digest the fat amount and being over ketotic. I would say give it a shot! Ask him if he is willing to try taking the oil in a syringe. My daughter is 7 and she can swallow the entire 10g dose all in one shot. I don’t think she even really tastes it since it goes straight to the back of her throat. This gives you the option of packing meals like cheese cubes, fruit and mac nuts… meals that are very simple to eat. He could also go to the nurses office to get the oil. He might be open to trying. One other thing, when we first started giving the oil in a syringe, my husband and I did one along with her for the first few times. It really is not that bad, and you would be surprised at how fast you can get used to the taste. Coconut oil is her favorite. great lunch out. Looks like Charlotte is really enjoying it…great use for left over chicken from the night before! Yay for a quick lunch out! And what a great idea to separate the tortilla layers! For Nora (also on 3.5:1 ratio) we use “Smart and Delicious” low carb, high protein tortillas by La Tortilla Factory, she gets 1/4 tortilla at a time of the large burrito size tortillas, at most in a meal. Often she gets 1/8. But they are quite thick, so I can see that separating the layers would work. Because they are thick I also use them as an easy pizza crust. Top the 1/4 tortilla with pizza ingredients and fry in a skillet for a short time with the lid on. It gets the bottom crunchier and the cheese melted on top. Which low carb tortillas are you using? To follow up on your “be careful” comment, we use the nutrition information on the tortilla package to calculate meals. When I met with our dietician, we noticed that the breakdowns in the online ketocalculator.com for those same tortillas seemed very different than the package (we don’t use the online tool to build meals, but that’s a whole different story). Our dietician was going to check on it but I have not heard from her about it. We continue to use the back of the package because we have not had a problem with them, but always double check if in doubt. Hi, Yes I think we are using the same brand of tortillas as you do. I have to say, I actually like them a lot just for myself! I have asked to verify that the nutritional information for the tortillas is correct in the calculator. When I find out, I will post a follow up comment! For future reference, IF you ever find anything that does not seem correct regarding nutritional content, please e-mail me or your dietitian and ask her to notify Beth Z at the Charlie Foundation so it can be corrected in the calculator. Many other people may be using the same incorrectly! thanks for passing this info along.